Since 2009, EcoGourmet has enhanced the technical and administrative capacities of artisanal fishing cooperatives and to achieve responsible fishing. EcoGourmet facilitates the signing of fair agreements between suppliers, fishing cooperatives and restaurants and sensitizes consumers to the ramifications of their purchasing decisions. Participating restaurants offer locally sourced, sustainably caught fish. Negative impacts on ecosystems are reduced while profits for local fishers increased. In Colombia, local fishing communities generally live in isolated areas, far away from cities and markets, have limited infrastructure, means and knowledge to properly produce and handle fish products that meet the high quality and sustainability standards big markets require. 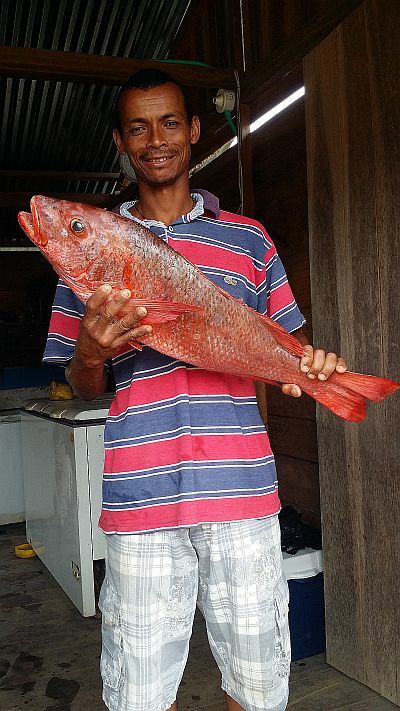 This results in the use of unsustainable fish practices, high production costs and low income for local communities. 858 fishermen distributed in 5 community based organizations, and fish consumers in 6 allied restaurants. 1. Institutional strengthening of the organization in charge of the community based Cold Chain Network (Red de Frío) and improvement of their infrastructure and quality processes. 2. Promotion of responsible fishing practices and contribution to the sustainability of fisheries. This includes fishing in allowed areas, not capturing threatened species, using eco-friendly practices, capturing individuals that have reached sexual maturity and are well above the minimum size. To guarantee compliance with these criteria, a monitoring system was put in place. 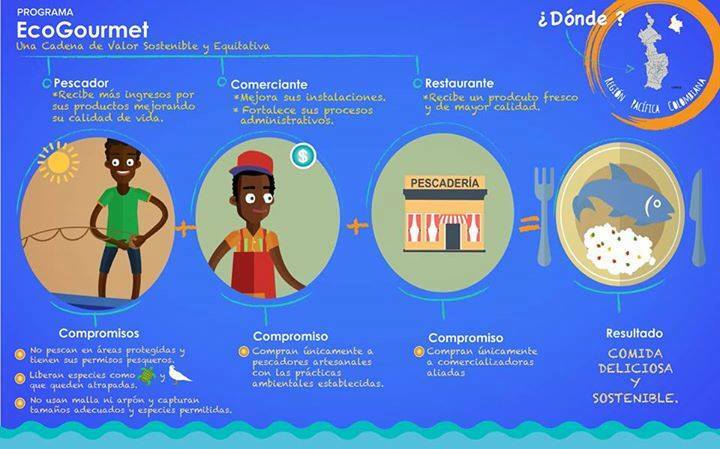 Formalization of the Wok (Chain of Restaurants) - Red de Frio commercial relationship, increased the quality of life of the fishermen, and their participation in the market by 13%. End-consumer awareness of responsible fishing practices: 197 Wok clients attended responsible consumption workshops and almost 600,000 clients saw the restaurants´ placemats that contained important information about sustainable fishing practices. Most importantly, at the beginning of the project 6% of clients kept in mind their environmental commitment when it came to selecting fish products, by the end of the project, this number had risen to 21% . The Bahia Solano cooperative Red de Frío has participated in EcoGourmet since 2012. Members deliver high quality fish products for consumption in Bogotá less than 48 hours after being caught. The process of joining EcoGourmet has not been effortless. It was a struggle to convince the fishermen of the need to use sustainable and selective fishing gear. Other difficulties included installing a cold room in one of the wettest and hottest areas on the planet, legally securing the tenure of the land where it was installed and implementing a system to ensure the supply of ice to fishermen at sea. Establishing an accounting system and budget and facilitating tax compliance were also challenging. Responsible fishing practices ensure the purchase of the product by the commercial partner. Failing to implement them would mean fishermen from Red de Frío would have to fish 83 more tons to meet their current level of earnings. “Today no one in Bahia Solano has NOT heard of responsible fishing", says Emilio Medina, a member of Red de Frio. It's a good start. Hopefully the word will spread.